Two lectures on Artistic Mathematics. If you are at this time in Berlin, you are welcome. Updated information about the Autumn School of Geometric Patterns in Islamic Art can be accessed through this link: Symmetrica 2017, Istanbul. I have got this pattern from my Turkish friend Ayhan Uzun. It comes from Seyit Battalgazi tomb in Turkey. Here is one of the photographs that I got. This beautiful Islamic pattern was found in the Mosque of al-Salih Tala’s on the side of the 13th century minbar. 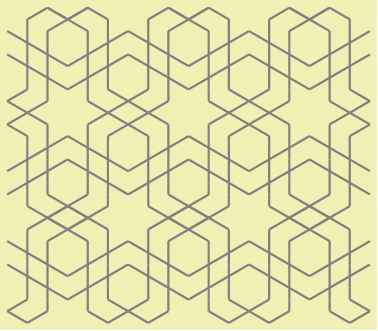 The pattern uses dodecagonal geometry and symmetry group *442 (p4m). More about this and other Islamic geometric patterns in my new book on gereh. In one of the earlier sketches I was showing construction of the mosaic in the entrance of the Sultan Ahmed Mosque in Istanbul. The construction presented there was using triangular grid and it was a bit tedious. In this sketch I want to go back to this mosaic and show how it can be created using regular hexagons and what consequences of such approach can be? First let me to remind you the view of the mosaic. It contains passages of zig-zags of double lines. Between them are formed regular hexagons and regular six-pointed stars. The picture below shows the pattern.